It was a great event for a great cause. 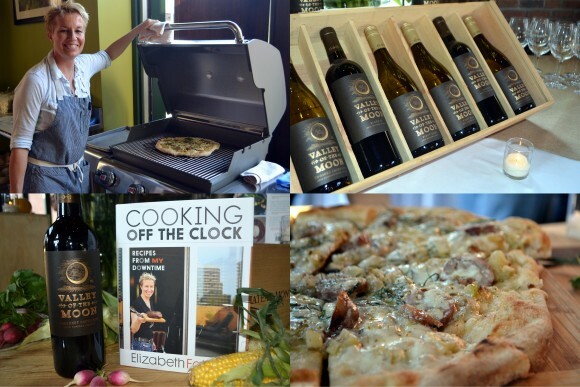 Seventy five pizza craved guests joined Celebrity Chef Elizabeth Falkner at Napa & Company to sample some incredible pizza and raise money for The National Center of Learning Disabilities. When I entered the dining area shortly after the 6PM start, Chef Falkner was already grilling the dough on the Weber grill. As she flipped and turned until perfectly charred, she was chatting with other guests. Over the course of the night I witnessed her love of food, people and the enjoyment that she brings to all around her. Guest after guest approached her and she engaged each in conversation; she is one of the most gracious people I have ever met. For several hours, Chef Falkner grilled her doughs, then she worked her magic with the toppings and each was finished by Chef Adam Truelove in Napa’s ovens. As soon as they appeared on the tables they were consumed by incredibly anxious and eager guests. Positioning and quick hands were the order of the evening. And for those wishing a break from the constant stream of pizza, Chef Truelove prepared an assortment of hors d'oeuvres and a pasta salad. Cases of wines from Valley of the Moon Winery were explained and poured, including an un-oaked Chardonnay that was delicious. For those looking for a non-alcoholic option, mixologist Eric Ribeiro was ready. He prepared a yuzu and ginger cocktail for me that was outstanding. What a great way to spend a Friday evening with phenomenal pizza for a cause.